James Buchanan receives dual honors with the US Mint’s release of the 16th Presidential $1 Coin & First Spouse Medal Set. Most sets contain a dollar coin and a medal bearing an image of the First Lady. Not this one. Since Buchanan was never married while he served as the 15th President of the United States — in fact, he was a bachelor all his life, there is no first spouse image or theme on the medal. Instead, the medal set includes an uncirculated 2010 Buchanan Dollar and a bronze medal replica of Buchanan’s Liberty First Spouse Gold Coin. That medal’s reverse features Buchanan as a young man working in his family’s store. It was designed by David Westwood and sculpted by Joseph Menna. The front side has a reproduction of Christian Gobrecht’s designed Liberty Head Quarter Eagle which circulated in American change while Buchanan was president. The included $1 coin is similar to past issues where the reverse contains an image of the Statue of Liberty, designed and sculpted by Don Everhart, and the obverse bears an image of the president. 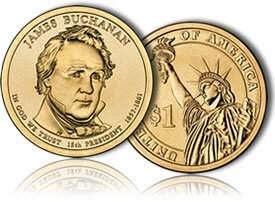 Buchanan’s coin portrait was designed and sculpted by Phebe Hemphill. Buchanan $1s do enjoy a notable distinction to collectors. The coins are scarcer than any other Presidential Dollar minted since the introduction of the program in 2007. 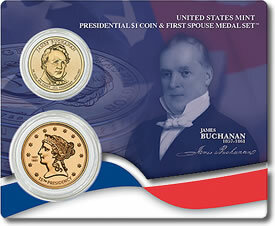 The Buchanan Presidential $1 Coin & First Spouse Medal Set is the third release in 2010. While Buchanan was the 15th president, the set is the sixteenth in the series because the tenth President, John Tyler, was married twice while he served. Two medal sets were issued as a result. Orders for the set may be placed through the US Mint’s online store at http://catalog.usmint.gov/, or by calling 1-800-USA-MINT (872-6468).